Malaysians are said to love food and convenience. This prompted a proliferation of food delivery services in recent years, using the convenience of websites, apps and even Facebook pages to reach customers. The food delivery market in Malaysia looks lucrative. It is expected to generate US$89 million in revenue this year and is estimated to hit US$202 million in 2022. The market is typically divided into two categories: restaurant-to-consumer and platform-to-consumer. FoodPanda is one of the better-known players in the platform-to-consumer space. It basically provides runners who pick up food from restaurants and deliver them to the customers’ doorsteps. The service is managed by restricting the orders to a list of curated restaurants and the meals they are prepared to offer at a certain price point. The company was acquired by Delivery Hero in December 2016 and has since been rebranded to sport a pink panda. This segment is getting crowded as similar services are provided by the likes of Honestbee, Running Man, Uber Eats and DeliverEat, among many others. Honestbee is a Singapore-based start-up that offers grocery delivery services. Upon its entry into the Malaysia market, it added food delivery to its service offerings. Homegrown Running Man offers similar services. Uber Eats attempts to leverage Uber’s (now Grab’s) network of drivers to deliver food as well as passengers. DeliverEat started in the northern city of Penang and is now looking to muscle in on Kuala Lumpur. Established restaurant chains have an upper hand as they can leverage their multiple locations for wider coverage. They already serve take-out food to walk-in customers and they only need to add a few delivery staff and motorcycles. McDonald’s has arguably the largest food delivery network in Malaysia. It offers delivery services and charges a fixed delivery fee regardless of the amount of food ordered. Buffet restaurant operator, Saisaki, introduced Shogun2U. PappaRich also added delivery services to its repertoire. Another segment merges both food production and logistics. These can be simple, home-based businesses promoting their menus via Facebook or, as in the case of Dahmakan, a highly technical and data-driven business. Founded in 2015 as a “full-stack” operation, Dahmakan has its own central kitchen, a team of chefs and logistics personnel. Its three founders, Jessica Li, Christian Edelmann and Jonathan Weins were formerly executives at FoodPanda in Hong Kong. They chose Kuala Lumpur as a testbed for their innovative food delivery system. The company is clear on its objectives: to provide affordable and tasty food that people on a work-week budget will want to eat daily. “Coming from a food delivery background, we knew it could get expensive. To make it affordable, we must integrate delivery and food production,” he explained. Dahmakan put together a team of chefs hired from hotels and restaurants and combined their culinary expertise with technology to conduct research and development (R&D). Its menu comprises popular dishes, best sellers, famous brands and artisanal creations of its chefs. The food is then customised for delivery. Dahmakan has developed proprietary algorithms to plan the most efficient delivery routes. It has also designed food packaging materials and methods to ensure the meals remain appetising upon arrival. Customer feedback and ratings are used to further tweak the product. Weins recalls Dahmakan’s first ever customer. “She ordered a pumpkin salad. We were so excited to see our efforts becoming a reality,” he said. “We interviewed the customer and shared our story. She said she will continue ordering from us. “We thought she was being polite, but when we got back to the office, she placed orders for the rest of the week!” he said. Dahmakan attracted significant interest from investors in its seeding rounds. In 2017, it became the first Malaysian start-up accepted into American seed accelerator, Y Combinator (YC), which invests in and mentors start-ups. Dropbox, Reddit Optimizely and Airbnb are some of its alumni. 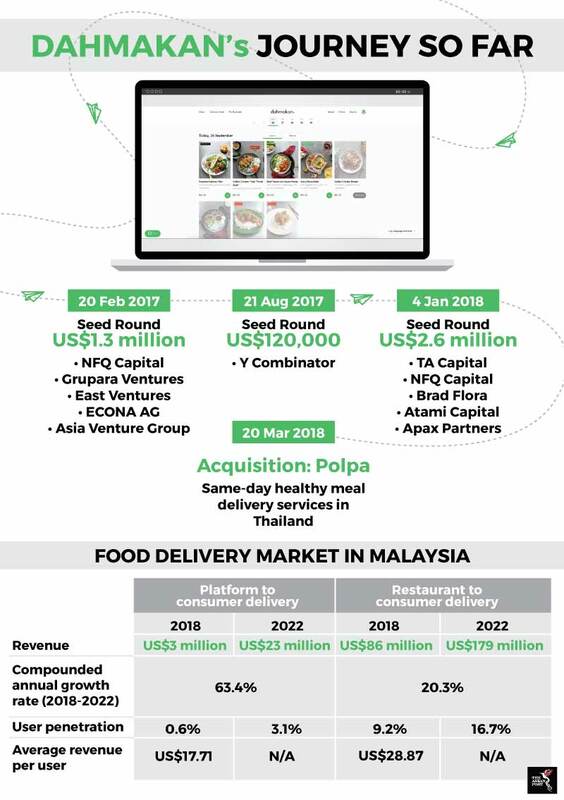 The company has expanded into Thailand by acquiring health food delivery company, Polpa. It aims to expand to all the major cities in Southeast Asia, and within 10 years, to break into Japan and Korea.